Cat Forks Details - Quasius Equipment, Inc. 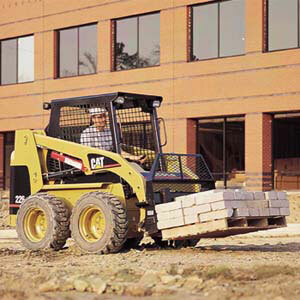 The Pallet Forks are a popular attachment for the Cat skid steer loader. These forks are designed to move pallets and material around a jobsite. Their capacity is limited to the capacity of the machine, which in this case is 1500 lbs. Because the lifting height of any skid steer loader is limited, they aren't designed to replace a full size forklift with a 25' or great lift height. They're limited to loading trucks and placing loads on single-tier scaffolding. These forks attach via the industry standard quick attach system and can easily be mounted by pulling two levers.